Printed and overprinted at The Mint, Lisbon. The first issues of both colonies, made on the same day, were overprints of Portuguese stamps. The issues are complicated by the fact that the overprints come in two colours (black or carmine) and two (according to Gibbons) or three (according to Scott) fonts plus, for Madeira perforations. Accordingly, only the '#1's are detailed initially. 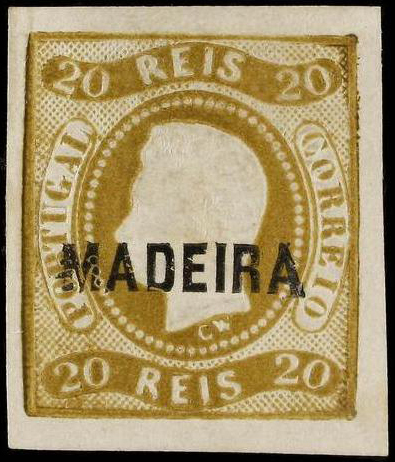 For Azores, overprints continued to be used until 1910. Unaltered Portuguese stamps were used from 1931. The Azores became an autonomous region of Portugal in 1976 and stamps were again issued in 1980. For Madeira, there is no Scott #1. Madeira followed a similar path with overprints, eventual real stamps (after 60 years in this case) and reinvigoration in 1980.